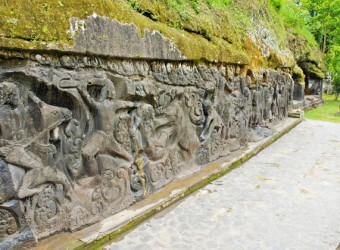 Yeh Pulu is located 1km south of Goa Gajah. After 10 min. walk through the paddy fields, you will arrive at Yeh Pulu. There is 14th century relief remains and curved lively ancient myth on 25m cliff. The myth is divided into 5 scenes. Krishna is going back on riding horse and the beer daughter pulls tail of horse as she stop him to go back; on their behind, 2 monkeys imitate their behaviors.